Moved into another tent taking place of man away on leave. 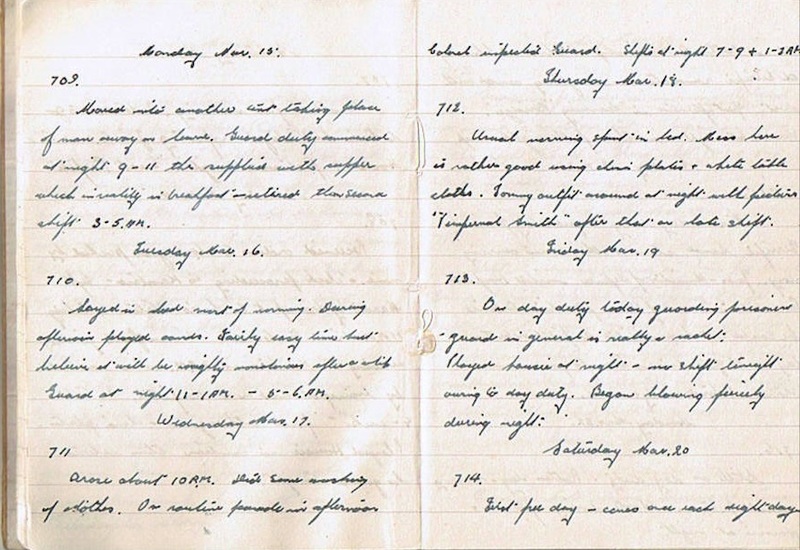 Guard duty commenced at night 9-11 then supplied with supper which in reality is breakfast – retired then second shift 3-5AM. Layed in bed most of morning. During afternoon played cards. Fairly easy time but believe it will be mightily monotonous after a while. Guard at night 11-1AM – 5-6AM. Arose about 10AM. Did some washing of clothes. On routine parade in afternoon. Colonel inspected guard. Shifts at night 7-9 & 1-3AM. Usual morning spent in bed. Mess here is rather good using china plates & white table cloths. Tommy outfit around at night with pictures “Pimpernel Smith” after that on late shift. On day duty today guarding prisoner – guard in general is really a racket. Played housie at night – no shift tonight owing to day duty. Began blowing fiercely during night. It now appears that guard duty kept him from going on leave. yes I am guessing they needed to cover all shifts – rest assured he does get to go on leave but not for another few weeks. Suggested reading – what better way to learn about history than from a contemporary diary? A fascinating project. Reblogged on Windows into History. As I said on Roger Pocock’s reblog, there’s nothing like an original document to bring history to life. 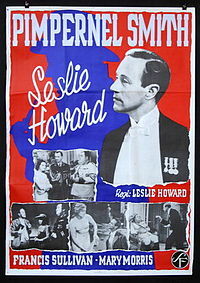 As for Pimpernel Smith, it’s the film that prompted my father to go on the stage! Such an untimely death for Leslie Howard. Thanks, glad you enjoyed it. I highly recommend reading his entries from operation crusader and the battles at El Alamein – they are in bold on the index page – link on home page of my blog. Does he mean “Mightily” monotonous.” on day 710? It doesn’t really matter. The same old story just keep rolling on. I am surprised he kept up the diary, still at least it was something to do.